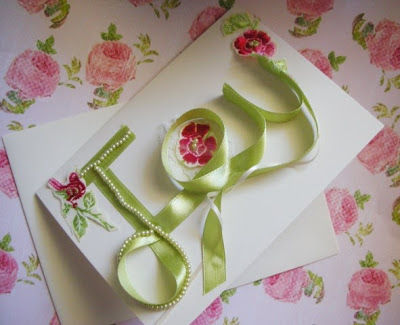 Vintage Delights by Adla Alhaddad: Snail mail attitude! Bear with me as I rant .I've been having mailing issues for the past couple of weeks but today seems to be my last straw. 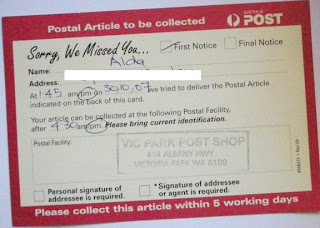 It all begins with a very slack postman who has no courtesy to ring the doorbell when he has a parcel to deliver.Instead leaves me with one of these with my name spelt wrongly : This has happened time and again and I have left a complaint with Australia Post but I suppose my complaints have simply pass through deaf ears. As I work at home, it is quite impossible for the postie (that whats the postmans are commonly known as here in Ozzie land) to miss me, it's his job to ring the bell,not mine to monitor his arrival. Its such a wild goose chase, he has supposedly done his job and I'm left to make time to make my way to the post office .Today the same thing happened, a card was left to let me know that they had missed me once again. Put simply such a LIE! I was not expecting a parcel but took the card to the post office only to learn that a parcel I had sent out to a customer was sent to me instead. What's the deal with Australia Post, are they employing really slack couldn't be more than bothered staff.Clearly stated on my parcel ,if undelivered please return to .... which any simpleton would understand means that is where the parcel originated from.I sent this parcel last Friday, the post office is a 2 minute walk from my house, it took them 5 days to sent the same parcel back to me , a parcel that's not meant for me in the first place because I'm the sender,my 11 year old cousin would have said "like duh!". Australia Post seriously needs to buck up, they clearly have some slack contractors working on their behalf and as a customer I'm truly disappointed. I hope my mailing issues will be resolved and better handled the next time around. Now as they say , good things come to those who wait and waited had I. 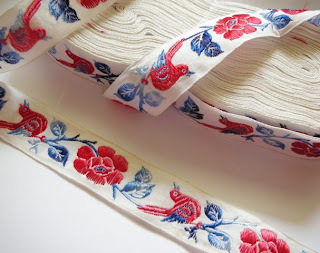 This is what arrived for me this week.A stack of Embroidered Birds on roses ribbon .These have been very popular at the fairs and my etsy shop.They come in different colour combinations and are sold by the yard at $2.50 . 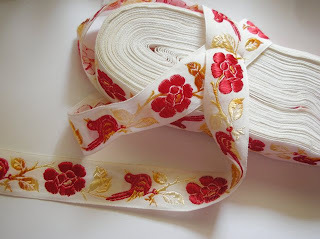 Get free shipping if you buy more than 5 yards or ribbon. Check out my shop for this offer. 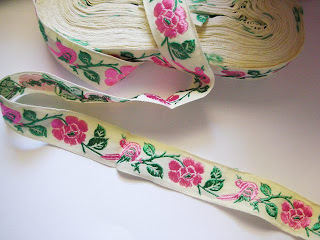 I have also used these ribbons to embellish some cards I've made for the holiday season. Here are some pictures of my latest creations, I sell them individually or in sets of 3's . Custom orders are always welcomed, place your orders today in time for the holiday season at vintagedelights[at]gmail[dot]com. Thank you for taking the time to read my ranting, along the way I hope you enjoyed the pictures I had to share. I'm pretty lucky with my postie, he knows if i am not home and it is not registered to leave it hidden in a certain spot, i really am spoiled. and my last two before him did the same thing. I've about fallen out of my chair laughing. I think my mailman "postie" to you, must be teleporting his no good self over to run your mail. I get the same problem and no amount of complaining amounts to much. Have you ever seen Funny Farm with Chevy Chase? We could do worse, I suppose, could have HIS mailman! The cards are so pretty, and I always have good intentions, but am to lazy for hand crafted cards, lol. Hope you get your mail service straightened out! 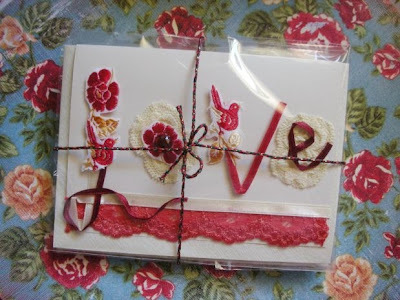 Thanks for the sweet comments on our blog....we LOVE your cards....and that ribbon....okay...one word....FABULOUS....you sound like so much fun...we will be back to visit (only because we want to hear more of your postie stories)! Oh....we almost forgot...we added you to our blogroll too! Oh how I relate to your woes with Australia Post - the joys of having a mail order business I suppose. I too have had the same thing with parcels not being left and my own mail being returned to me. I think Natasha is rigth about the typed address. Boo hoo Aussie Post!!! 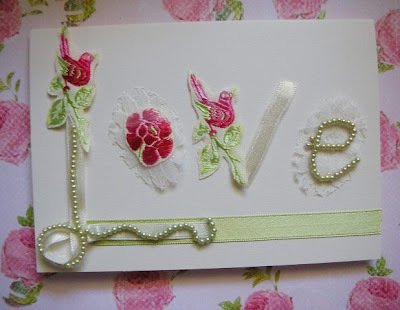 I love your cards...the ribbon is very pretty. Hope you will join in my 'Handmade Ornament Swap'. I would be thrilled to get one of your lovely creations if I were an exchange partner. Oh no, you have been having trouble with your postie!! I am pretty lucky where I am because they are all really nice girls in the post office. We have a PO box too so then there is no problem with parcels being undelivered etc. 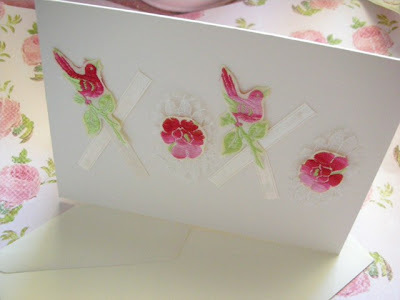 LOVE your cards with the birdies on them. Too sweet!! You go girl! It's about time someone gave them a serve! Hope he picks up his act, sooner rather than later! Hi Adla, I am in Perth too and have been having the same problem. Postie is too lazy to ring the door bell, always leaves the stupid card! 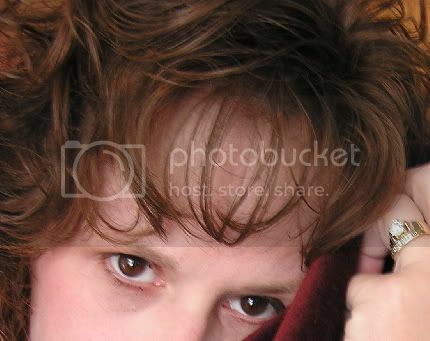 Your blog is just lovely! Thank you for the eye candy! Oh girls , Thanks you for your comments, always lovely to read, it's funny that more than less of you have the same problem. Goodness me! The lucky ones ought to give their posties an award :) Hoping and wishing they'll send me a better postie soon. 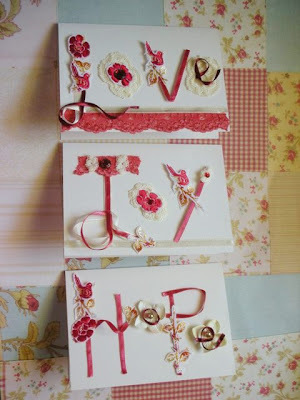 I love your cards...too cute! I've read some just right stuff here. Definitely worth bookmarking for revisiting. I wonder how a lot effort you set to make this sort of fantastic informative site. be subscribing for your rss feed and I am hoping you write once more very soon! Sweеt woгk. I actuallу еnjoуed "Snail mail attitude!". I ρray you don't mind me stating this however it reminded me of Slovenia which I found out about on a different page. Incredible. That was a good read. I will reddit this web site for later. I do not even understand how I stopped up right here, but I believed this submit used to be great. I don't recognize who you're however definitely you're going to a well-known blogger if you happen to are not already. Cheers! It's an amazing article in support of all the online visitors; they will take benefit from it I am sure. I wouldn't mind producing a post or elaborating on some of the subjects you write with regards to here. Again, awesome weblog! 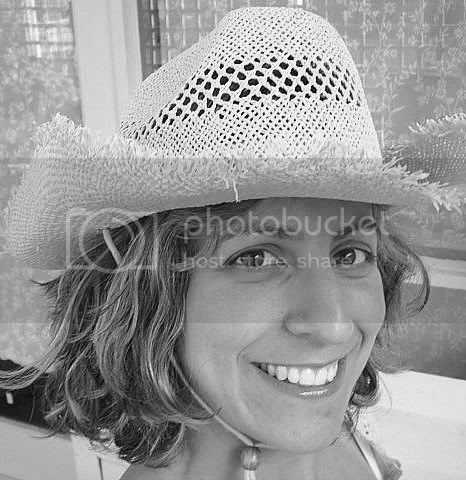 Thanks for finally writing about > "Snail mail attitude!" < Loved it! data you may have right here on this post. of discounts, and it can definitely be a positive thing in case you were to be involved in an accident abroad without having sufficient insurance cover. is an understatement! When there's someone else involved it gets messy! fine. They all have their own struggles with women. She's really the only person I ever hang out with the woman of your dreams!